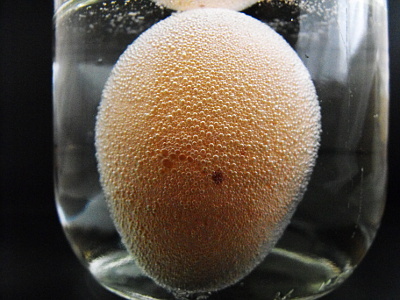 A rubber egg or naked egg can be made letting an egg sit in vinegar (a.k.a. acetic acid) over the course of a day or two. The outer shell of the egg is made of almost entirely calcium carbonate and the vinegar will dissolve this hard outer shell over time. The reaction between the calcium carbonate (base) and vinegar (acid) is an acid base reaction. This means we know that the products of the reaction will be a salt, water and carbon dioxide (since one of our reactance is a carbonate). The salt formed is calcium acetate which is able to dissolve in water. This means that vinegar will nearly totally dissolve the shell of an egg leaving you with a rubbery, water balloon egg. 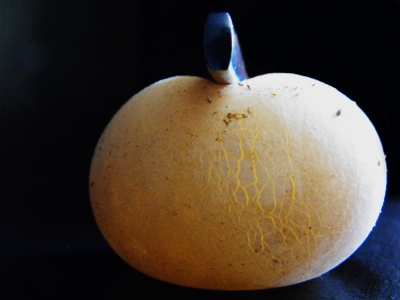 where the concentration of water is lower and eventually the egg will start to swell and finally burst. one large cell take a torch and have a look inside it by shining the light through the membrane. Once you have finished exploring the rubber egg you can dispose of it by putting it into a sealed plastic bag and throwing it into the rubbish bin. When I preformed the rubber egg experiment I thought it might be good if I then boiled the shell less egg and used it for the egg in a bottle experiment so I could get two experiments for the price of one egg. As it turns out the increased water content in the egg white makes it unstable and thus not suitable.